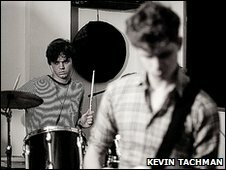 The BBC Sound of 2010 list showcases music's most exciting emerging stars, selected by more than 165 leading critics, bloggers and broadcasters. 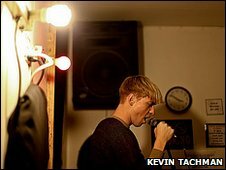 At number five, New York band The Drums are the first act to be revealed from the Sound of 2010 top five. The other artists from the top five will be revealed in reverse order every day until Friday, when the winner will be named. 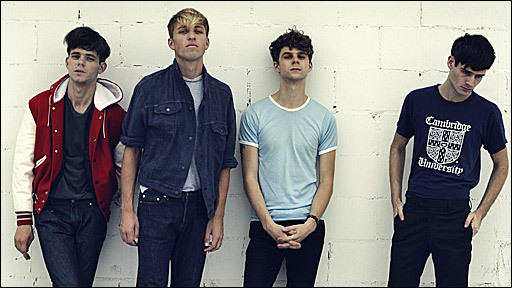 The Drums see themselves as the ultimate "generation me" rock band. They are all about selfishness, liberation and simply written songs. They say this self-centred attitude means they try to please themselves with little thought to the outside world. And it is, ironically, one of the things that draws their fans in. Another attraction is the band's vivid presence on stage, where singer Jonathan Pierce's spasmodic and contagious moves are wild but remain elegant, like his strong roller-coaster voice. 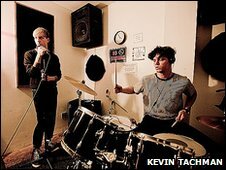 Guitarists Adam Kessler and Jacob Graham bring to mind California's surf pop of the Beach Boys, while Connor Hanwick's thumping on the band's signature instrument gives an undercurrent of romantic goth. "We only write about two feelings - one is the first day of summer when you and all of your friends are standing on the edge of a cliff watching the sun set and being overcome with all of your hopes and dreams at once. "The other is when you're walking alone in the rain and realise you will be alone forever." Jonathan Pierce: I wanted to be an actor in Hollywood. I thought it was so glamorous. My dad actually made an album in the early 80s when I was just a kid. I think that was like, if my dad can actually make [an album] anyone could just make an album. Maybe that's what planted the seed in me, why I wanted to do something like that in the future. If we had to call ourselves anything, it would be a rock 'n' roll band that writes pop songs. That's really our biggest passion - pop songs and reaching that perfect pop moment, which I don't know if we've done. Who are your three biggest musical heroes? To cover all the bases, because I love so much stuff, musically the most influential would be New Order. They probably influence me the most. certain songs of Lou Reed, he is pretty amazing. Jacob and I were living in Florida. We were probably writing the first song, Best Friend. I was just working in a shop, dumb day jobs, and we would come home and make music. We didn't even know Connor. Has your life changed in a year? My life has completely changed. I don't have a day job any more. From the second I wake up to the second I go to bed, the band is pretty much on my mind non-stop. It's all moved so fast, much faster than we could have ever expected and probably faster than we wanted it to... We are still trying to find our legs, so to speak. There are growing pains and we are growing very fast. Usually everything we are trying to do right now, bands do before everyone is watching them. So it's kind of weird to do it in reverse almost. We are trying not to look stupid in the process of figuring out what we are doing. Your music is, in your own words: "A sense of enthusiasm followed by the ultimate sadness." Does this relate to a feeling of disarray among young people in the US? I don't know. It seems like everyone was pretty excited around election time, you are right about that. But I don't think our music has anything to do with a political climate or anything like that. It comes more from the inner workings of your heart. It's much more personal than that. We've always felt very cut off from everything. I guess we just keep to ourselves, do our thing. Whether it is responsible or not, or respected or not, that's just how we operate. You are pretty clear about being part of "generation me". I've felt that way since I was a child and I've been so lucky enough to find three other people who feel the same way or something like that and it's a sentiment we all share. I'm thankful to be in a band with people who don't think I'm ridiculous for saying such a thing, even if the whole world does. What do you think the pop landscape will look like in 2010? From the 50s to the 90s, people were not afraid to write songs. And in the 2000s it seems like nobody was writing songs any more. Everything was about production and getting things produced and hiring hot producers... That's all we cared about. It's sort of the return to the song that I think we have lost for 10 years. We have already seen traces of it in 2009. People are dying to just hear a song real, sincere, stripped down and honest. 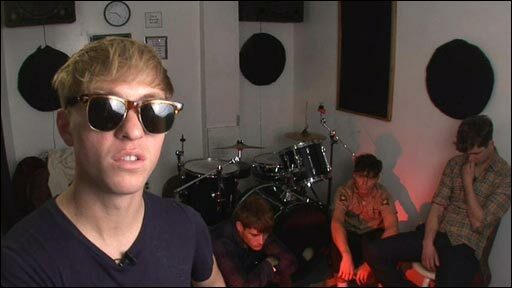 The Drums were speaking to the BBC's Ramon J Goni in New York.